Andy Rimmer’s award-winning Offa Studio joined the Skian Mhor family in April 2017. With a focus on fantasy and Norse art, Andy brings an extra level of decorative detail to the weapons, props, masks, puppets and monsters that he creates. Using his skills and decades of experience within LRP and arts practice, as well as the Skian Mhor techniques, high-quality materials and specialist workshop, he is making some beautiful pieces and contributing his skills to help with Skian Mhor and Even Mhor commissions, and has also been known to help out with Mhorish. 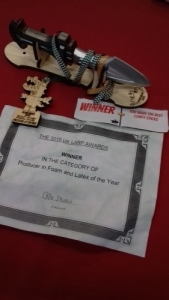 Andy won the award for ‘Larp Producer of the Year – Latex/Foam’ at the 2018 Larp Awards. Andy is most definitely in possession of some form of arcane magic, a magic that comes through in his work. The pictures speak for themselves, though until such time as we manage to create the gallery on this site, details and photos of what’s on offer are best found on the Offa Studio Facebook. If you have an enquiry regarding a commission or a piece that you’ve seen on Facebook, you can contact Andy via FB messenger or his contact page.